BRUSSELS (Reuters) - European Union leaders will on Friday offer Britain a Brexit transition deal, the summit chair Donald Tusk said - but the deal will only be finalised if London honours its commitments on the Irish border and Gibraltar. As sought by London, British Prime Minister Theresa May will be offered a 21-month, status quo transition period to help businesses adjust to Britain's official withdrawal from the EU, due in March 2019. "I have some good news for Prime Minister Theresa May," Tusk told a news conference. "I have just recommended to our leaders that we welcome, in principle, the agreement on transition." "It is important – not least to our people and businesses – to buy this time, so that everyone is prepared for the real impact of Brexit." But the deal will only take effect if the two sides agree within the next year on the future status of both the Irish border - an issue they have so far struggled to reach agreement on - and Gibraltar. As well as offering Britain an interim accord on Friday, the remaining 27 EU states will also agree on their joint negotiating stance for further talks with London, due to start next month, on the two sides' future relationship. Spain had voiced concern about how the transition deal would affect its demands for a final say on how Brexit affects the British territory of Gibraltar on Spain's south coast. Spain ceded Gibraltar to Britain in 1713 but wants it back. The territory, which is due to leave the EU along with the rest of Britain but which voted 96 percent in favour of remaining in the bloc, is keen to preserve movement of people across its border with Spain. As a result, the text to be endorsed by the 27 EU leaders on Friday reminds London that the transition agreement will only become legally binding once the whole treaty on Britain's exit from the bloc is agreed and ratified, probably next year. "The European Council calls for intensified efforts on the remaining withdrawal issues as well as issues related to the territorial application of the Withdrawal Agreement, notably as regards Gibraltar, and reiterates that nothing is agreed until everything is agreed," the latest draft document read. 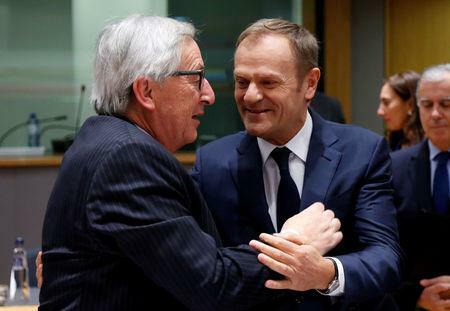 Tusk said the document, which was seen by Reuters, had the backing of both Spain and Britain. The deal on transition comes at the expense of another fudge over how to avoid border checks on the island of Ireland after Brexit, the most difficult circle to square for Brexit negotiators on both sides. London and Dublin are committed to keeping a free flow of people and goods over the intra-Irish border without returning to checkpoints - as during the three decades of violence in Northern Ireland. But finding a practical solution for any customs checks needed post-Brexit has proved elusive so far.